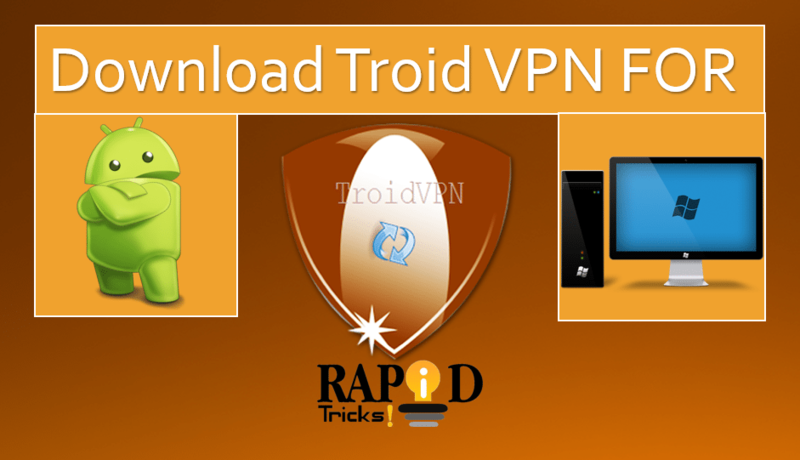 Wondering where to download Troid VPN APK latest version? Well if the answer is yes then you are at the right place. As you read further in this article we will be sharing the Troid VPN download link for Android and Troid VPN for PC. And tell you how can you install the application on your Android smartphone and PC. VPN is very helpful when it comes to protecting our privacy and browsing Internet Anonymously. Now the VPNs are not only limited to PC but also you can use them on your smartphones. So I am going to provide you a popular VPN for Android smartphones and PC called Troid VPN, which will help you to browse internet securely for absolutely free of cost. You would also be interested in Best VPN Softwares for PC & MAC. First of all, you do not have to be a root user. The app interface is easy to use so anyone can use it easily. The App masks your IP address and identity using VPN server IP. Troid VPN offers daily free privacy protection on your 100 MB Data. The app supports TCP UDP ICMP VPN. You can choose VPN Server locations from 15 countries. You do not need to register for the app in order to use it. The app protects your online privacy. It helps you to increase your Internet Speed. It saves bandwidth by compressing data. The app offers Wi-Fi Hotspot Security. In the Troid VPN, VPN Protocol Selection and Port selection available which makes it a robust VPN proxy tool. Well, the reasons are many for using troid VPN on Android smartphone but I will try to tell you the most important benefits of Troid VPN so you will have a reason to use it on your Android Phone or PC. Search engines will not be able to track your searches. You will be able to protect your privacy. Also, You will be able to access county based websites. You will be able to download and update P2P files. Step 1: First of all, you have to download troidvpn for android. So simply follow this Troid VPN download link. Step 2: Once you are done with the download of Troid VPN, you have to install it. So simply tap on the file that you have downloaded and the app installation process will get started. Step 3: Once the download process is started you have to follow all the screen instructions and you will get done with the app. Step 4: Now simply open it and you are all set to use it. Troid VPN is not officially available to download for PC or MAC but as you know in today’s world almost everything is possible in Tech era. So we have a solution of that as well and you can easily use Troid VPN PC app same as you use troid VPN APK on Android. You can call it Troid VPN hack 🙂 just kidding, this is just a simple step by step guide for using troid VPN on PC. So Follow the super simple steps given below to Download Troid VPN on PC. First of all, download any of the best Android emulators for PC from the list (You can use Bluestacks). Now after successfully downloading the emulator on your PC, install it and launch it. Now login to Android emulator using your Google ID. When you are logged in open this link to download Troid VPN APK file. Download and install the Troid VPN APK on your PC using Android emulator and launch it when you successfully install it. That’s it! Now just open Troid VPN and start using it on your PC. So that was all for the download Troid VPN and how to install the application on your Android smartphone. The application is not available for Windows or IOS platforms. Also, the application may not support on your device as there are some restrictions on some countries so make sure you are downloading the app and figuring it out by yourself. At the end, if you have any questions you can comment below and we will surely help you out.